God is so good to us. He shows us who he is by his acts of power and provision on our behalf. But he doesn’t stay hidden from us - just staying in the background. He wants to be known by us. So he gives us his names. When you call someone by their name, it means that you are beginning to know them. When you learn God’s names and begin to use them, you will draw closer to him in intimacy. God’s character is revealed by his names. Get to know his names. Begin using his names, and you will know him better. 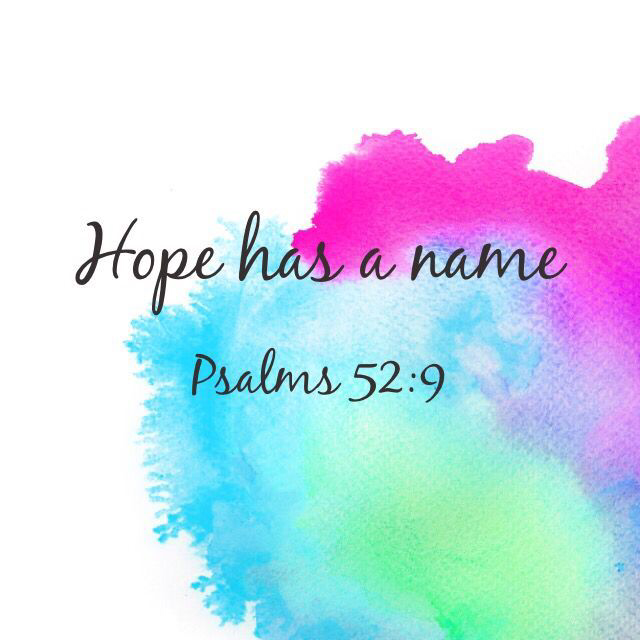 In Psalms 52 David says that he puts his hope in God’s name. Remember, God’s name reveals his character. He is called the God of hope (Romans 15:13). Real hope is found in God alone. You can look for small hopes in a cup of coffee, a relaxing weekend or a good sleep-in. But, God provides an enduring hope that doesn’t fluctuate with your feelings. God’s hope is based on his consistent character. He is full of hope for you, because of his own faithfulness to you. “May the God of hope fill you with all joy and peace as you trust in him, so that you may overflow with hope by the power of the Holy Spirit” (Romans 15:13). Speak out God’s name. Call out to the God of Hope. Declare who he is, and his hope will begin to permeate your spirit. God desires for his name to be overflowing in your life… for his hope to be welling up and pouring out of you. Use his name! You are encouraged to use this content for personal devotions, small groups and church groups. It may not be re-published or sold at any time.